Made of bone china, this Cartoon Couple Plate features a loved up bride and groom in the centre surrounded by pink hearts. 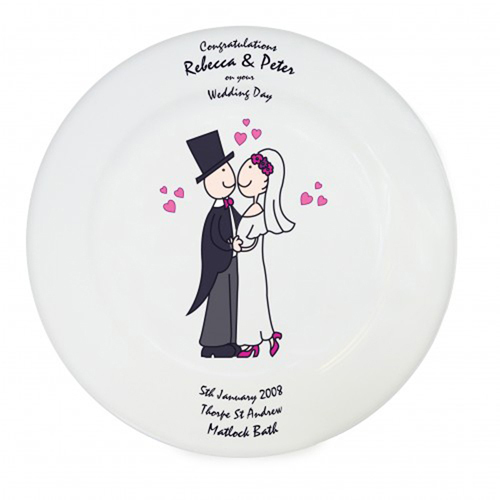 Make your wedding gift a cherished keepsake with this personalised cartoon couple design 8 inch bone china keepsake plate! The plate can be personalised with the couples name, date, venue and where (e.g. Macclesfield) 30 Characters Per Line. 'Congratulations' 'On Your Wedding Day' will be fixed text on this item. Personalise with the couples name, date, venue and where (e.g. Macclesfield) 30 Characters Per Line.